What begins as an act of rebellion and vandalism against an uncaring corporation becomes much, much more. Play as Cloud Strife and his band of rag-tag heros as they struggle to save the planet's life from being consumed. The game's story will keep you on your toes, and over the course of three CD-roms you will encounter and be able to recruit 8 other playable characters ranging from the leader of an underground resistance group to a captured lab experiment. Battles are played out as turn-based affairs. You can customize your weapons and armor with materia which allows the equipped character to use the ability and/or magic that is associated with the particular materia. This lets you really mold the party into working the way you want. Summon spells are back in Final Fantasy VII and they are as powerful and impressive as ever. There are plenty of things to do to keep you busy on your quest, but in the end, the fate of the whole world is in your hands! 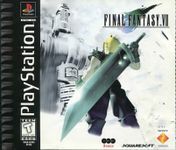 Final Fantasy VII was released for the PS in 1997 and for the PC later in 1998. There are also microbadges for other characters and character types of the Final Fantasy series.